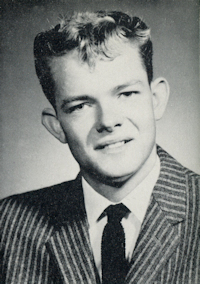 Obituary – Wilde, Donald E. “Donnie” « Perry High School Alumni Association, Inc.
﻿Lettermen’s Club ’59-’61; Basketball ’58-’61; Spanish Assembly ’58-’60; Track ’58-’61; Junior Play ’59-’60; F.T.A. ’60-’61; Christmas Vespers ’59-’60; Teen Town Council ’59-’60; Student Council ’60-’61. Donnie Wilde, of Perry, was born in Long Beach, California on October 3, 1942 and was the son of Edmund Otto and Sylvia (Barnes) Wilde. He died at 9:00 a.m. Wednesday, November 7, 2001 at the Perry Nursing Home at the age of 59. Graveside rites were conducted at 10:00 a.m. on Friday, November 9, 2001 at Mt. Carmel Cemetery, northwest of Perry and will be under the direction of Brown-Sisson Funeral Home. Wilde, a long-time resident of the Perry community, was a farmer and fence builder. He and the former Theresa Golden were married in Perry on May 2, 1985. He was affiliated with Christ Lutheran Church. In addition to his wife, of the home, survivors are a step-son, Chris Simon and his wife Teresa of Perry, Oklahoma; a step-daughter, Mandi Justus and her husband Seth of Perry, Oklahoma; three grandchildren, Brycen and Avary Justus and Jacob Simon, all of Perry, Oklahoma; his mother Sylvia Wilde of Perry, Oklahoma; one sister, Darlene Terrell and her husband, Punky of Clark, South Dakota and a number of nieces, nephews and cousins. His father, Ed Wilde, one sister, Janice K. Wilde and one brother, Lonnie Wilde prededed him in death. A memorial has been established to benefit research for the cause and a cure for Amyotrophic Lateral Sclerosis (ALS), better known as Lou Gehrig’s disease.